Picture provided by Marcel Staron. Masjed-e Jâme' of Isfahan represents a condensed history of Iranian Architecture. It displays architectural styles of different periods in the country's Islamic architecture. 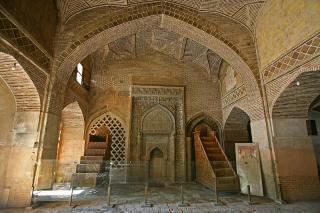 The mosque was built in the four-iwan architectural style, placing four gates face to face. It later became a prototype for mosque and dome design. 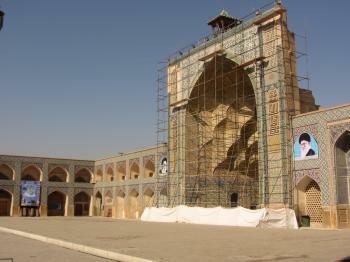 Located in the historic centre of Isfahan, it is the oldest Friday mosque in Iran. It was developed from the 9th century onwards. Site visited January 2016. The great city of Isfahan is full of marvellous sights. Imam Square and the famous bridges are usually in the center of attention. Congregational mosque Masjed-e Jāmé is often overlooked maybe because of its remote location. 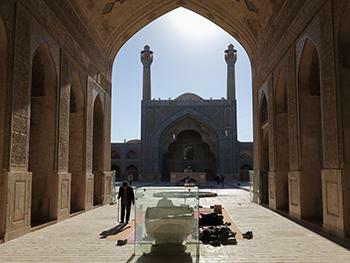 This architectural masterpiece was the latest addition to Isfahan’s World Heritage Sites. One of the great things about this site is its location surrounded by the vast Grand Bazaar of Isfahan. It is 1,5 kilometres walk from Imam Square and finding your way in the labyrinthine alleys of bazaar to the mosque is part of the fun. Although the size of the mosque is enormous you can hardly notice it when you walk next to it in the bazaar. You just pop in from a modest gate and suddenly you are in the center of this historical complex. Masjed-e Jāmé of Isfahan is one of the oldest and biggest mosques in Iran. It has been constantly constructed, reconstructed and renovated so there are many historical layers. It is the first mosque that was built in four-iwan courtyard style and it became prototype of this architectural style in the Islamic world. There are two great domes opposite each other. Behind the large stalactites of south iwan is the robust brick dome of Nezam Al-Molk which is one of the biggest domes of its time. Behind the north iwan is Taj Al-Molk Dome which is a masterpiece of Persian architecture. Its geometrically perfect and balanced structure is very impressive. The four iwans are surrounded by large prayer halls with numerous pillars. In the west iwan is the beautiful Room of Sultan Uljetu which is richly decorated. The atmosphere in the mosque was calm and silent which was a relief after hustle and bustle of bazaar. You could hear only the sound of flocks of pigeons which were flying around the courtyard and the minarets. There were only few other visitors. It was very enjoyable to slowly wander around the rooms and explore all the great details they have to offer. And there are lots of them. Iran is full of beautiful historical buildings and especially mosques. In some places you may even think that there are too many of them to really appreciate them all. It makes you think what makes just this complex worth of inscription. While it might not be as flashy and shiny as some other famous mosques in Iran, the historical and architectural values of Masjed-e Jāmé of Isfahan are unquestionable. Besides, it is also a calm and quiet haven amid the busy and noisy bazaar and as such it is a great place to visit. On first viewing as I approached, the mosque was honestly underwhelming. I had read about the wondrous nature of its dome, and so was naively expecting a dazzling tiled beauty. Instead, there was a dome of faded brick, rising above a construction site plaza. I was also looking at the wrong dome; the ‘perfect’ one is considerably smaller than the other, and thus less visible from afar. Once entering the mosque proper, however, this disappointment ebbed away. The interior of the two domes was both striking architecturally and aesthetically, high above the ground and decorated extensively. As someone uneducated in the field of architecture, I was not able to fully appreciate the nuance of the domes’ dimensions, and how they differed from the many other domes I have seen, but it was still a satisfying experience. The view of the four famed iwans from the central area was unfortunately marred by scaffolding covering one of them, but the view of workers removing and replacing tiles at the very top was an interesting consolation prize. The lack of any harness at that height made the experience slightly nerve-wracking. The gaze of the ayatollahs emerging from beneath the network of poles was also a somewhat amusing image. I also really enjoyed the sad little UNESCO plastic plaque sitting in the middle of the courtyard, atop a dry fountain pool area. Some advice, however; I arrived at opening time (9am), and had the mosque to myself for about 10 minutes, at which point the first tour group arrived. By 9:30, there were 3 of them at once. This was hardly overwhelming, as the grounds are vast, but the experience feels a lot more intimate without a few dozen tourists standing in the middle of the square. Damaged in War since WWII: In 1985 Iran Iraq war by rocket attack.